With the Leica V-Lux, Leica Camera AG, Wetzlar, presents the next generation model of the Leica V-Lux product line. The new digital compact camera combines a high-performance lens, superior imaging qualities and high speed in a compact and handy form. Its Leica DC Vario-Elmarit 9.1–146 mm f/2.8–4 ASPH. super-zoom lens offers an enormously broad spectrum of capabilities from macro to extreme telephoto photography and, in combination with its versatile package of features, makes it the ideal all-round camera to take along wherever you go. For travelling, sports or other outdoor activities, the Leica V-Lux is simply the ideal camera for every situation. Thanks to its zoom range of 25 to 400 mm (equivalent in 35 mm format), time-consuming lens changes and the weight of additional equipment are now a thing of the past. It covers every photographic situation from wide-angle, standard and telephoto photography to macro close-ups down to a distance of only 3 cm from the subject. With initial apertures of f/2.8 (wide angle) and f/4 (telephoto), its Leica DC Vario-Elmarit 9.1–146 mm f/2.8–4 ASPH. lens enables sharp and finely detailed exposures, even of distant subjects. 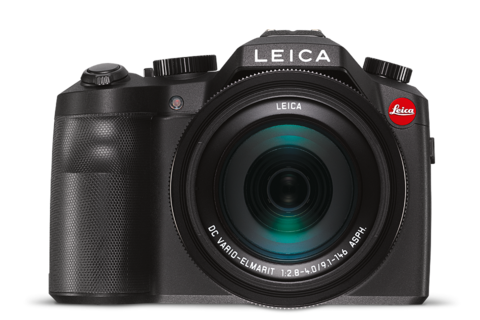 Also in unfavourable light and at high ISO settings, the large 1" sensor of the Leica V-Lux guarantees exceptionally bright and clear pictures and this, in combination with the high speed of the lens, considerably expands the creative scope offered by the camera. Its fast autofocus system provides even greater versatility, responds immediately to changes within the image frame and makes it possible to reliably capture fast-moving subjects – for example, the action at sporting events. Users also benefit from this when shooting continuous sequences, as the V-Lux can capture up to 12 frames per second at full resolution. The performance package also includes a new video function for moving pictures in 4K high-definition digital format, with a resolution four times higher than full HD. The design of the Leica V-Lux is characterised by compact size and extremely easy handling. Its integrated handgrip keeps it steady in your hand, and its light weight even lets you shoot using only one hand. All of its controls are clearly laid out and simple to use. This leaves photographers more time to concentrate on the picture that, thanks to the multi-axis rotate-and-tilt function of its 3" LCD monitor screen, can also be captured with ease from almost any angle. All camera settings are displayed in the integrated, 2.4 megapixel, OLED electronic viewfinder and on the monitor screen. The Leica V-Lux has an integrated Wi-Fi module that allows remote control from a smartphone or tablet and wireless transfer of still picture and video data via a WLAN connection. The Leica Image Shuttle app required for this function can be downloaded free of charge and installed on iOS or Android devices. An extensive range of technical equipment, bags and cases is also available for the Leica V-Lux (visit www.leica-camera.com for more information). The Leica V-Lux will be available from authorised Leica dealers from October 2014. The camera comes complete with Adobe® Photoshop® Lightroom®, the professional workflow solution for still picture and video processing, available as a free download after product registration. Leica Camera AG – производитель фотокамер и оптики для спорта и отдыха премиум-класса, осуществляющий свою деятельность в международном масштабе. Непререкаемый авторитет бренда Leica основывается на давних традициях внедрения передового опыта в изготовление оптики. И сегодня, обогатив высочайший уровень мастерства инновационными технологиями, Leica продолжает выпускать продукты, обеспечивающие наилучшее качество изображения в сфере визуализации и восприятия в любых ситуациях. Штаб-квартира Leica Camera AG расположена в городе Зольмс, земля Гессен, Германия. Кроме того, компания имеет производственные площади в Португалии, в городе Вила-Нова-де-Фамаликао. Компания осуществляет свою международную деятельность через филиалы, находящиеся в Англии, Франции, Японии, Сингапуре, Швейцарии, Южной Корее, Италии, Австралии и США. В последние годы главной движущей силой позитивного развития компании стали новые и инновационные продукты.